Those who trained to be knights were generally the sons of knights or lords. (In some cases, the sons of commoners could train for knighthood -- they were placed in the house of another lord or knight. There, they were bestowed with the title of page. Huntsmen and falconers taught them how to hunt, and priests or chaplains taught them religion, reading and writing. Pages learned to fight by imitating knights and practiced combat with each other using wooden swords and lances. At the appropriate time, A page could become an esquire (or, more simply, squire). 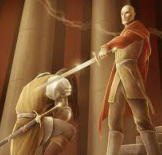 In a religious ceremony, the new squire took a consecrated sword from a bishop or priest and swore to use it for religious and honorable purposes. After this ceremony, the squire took his place in his lord's household and attended to his duties. During this period of squiring, the would-be knight learned to serve and mastered the intricacies of social behavior and chivalry. Besides carrying out their duties in the lord's household, squires learned the martial arts of being a knight. They learned how to handle horses and continued practicing with wooden swords and lances -- sometimes with the knights themselves. They wore chain-mail armor to get used to its weight (and sometimes even danced in hauberks, or chain-mail shirts). They exercised and trained in full armor. Squires would also assist the knights in combat, at tournaments and in travel to foreign lands (carrying and cleaning armor, taking care of the knights per instruction. In the European Middle Ages, a formally professed cavalryman, generally a vassal holding land as a fief from the lord he served. At about seven a boy bound for knighthood became a page, then at twelve a damoiseau (“lordling”), varlet, or valet, and subsequently a shieldbearer or esquire. When judged ready, he was dubbed knight by his lord in a solemn ceremony. The Christian ideal of knightly behavior (chivalry) required devotion to the church, loyalty to military and feudal superiors, and preservation of personal honor. Placed in the house of a knight, nobel, or lord. Given the title of Page. When appropriate, became Lordling or Valet. Promoted to Esquire or Shield-bearer. Learned the Art of Chivalry. Begin Training in the Skills of Knighthood. Knighted by the King, Noble or Knight of Authority. * By the 16th century knighthood had become honorific rather than feudal or military.